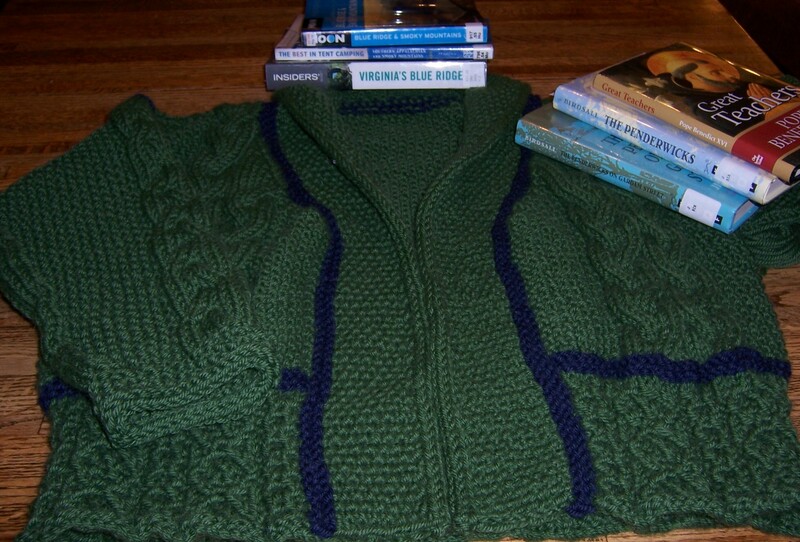 Cabled Jacket, Penderwicks and Camping ... oh my! … are all on my mind right now. We’re winding down the formal schooling and in the midst of rehearsals for LoW Player’s summer production of Oklahoma, so our reading is shifting to a lighter more earthy tone: Virginia’s Blue Ridge, The Best in Tent Camping: Southern Appalachian and Smoky Mountains, and Moon’s Blue Ridge and Smoky Mountains … since gas prices are so darn high (and everything else of course is going up, wreaking havoc on my budget! ), we’re staying close to home this summer and camping … LOTS! We’re half-way through our re-read of The Penderwicks while we await the third in the series to come in the mail: The Penderwicks at Point Mouette. Just so you don’t think I’m going too earthy, I’ve also started reading Pope Benedict’s book, The Great Teachers (which is a VERY good read for us academic types). 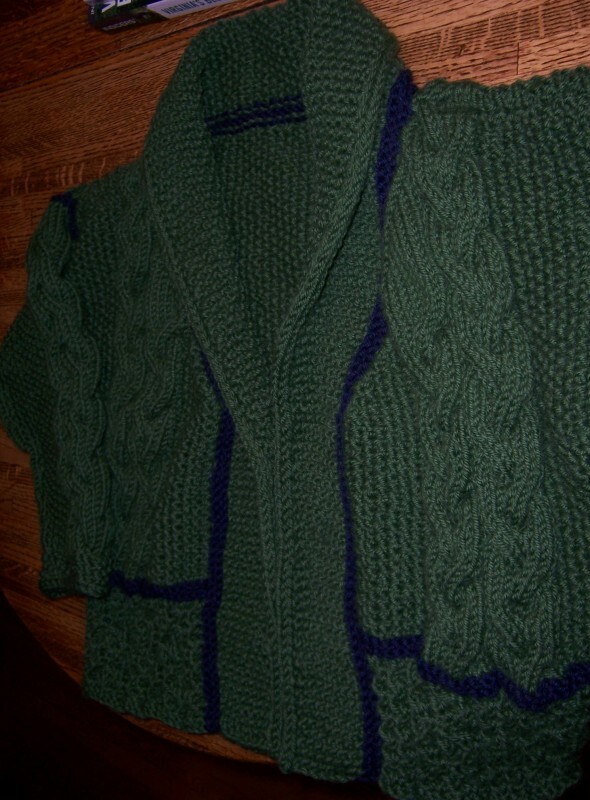 On the knitting needles: I’m just finishing up the Cabled Jacket and I need some help: what should I name this thing … it’s a deep green with navy, will be zipped to the start of the v-neck shawl collar, and is filled with cables and coziness. I’ve got about half a sleeve left and then hand-sewing in the zipper and it’s done (I’ve even already tucked in most of the ends so that when I’m done … I’m done!). So what would you name it? 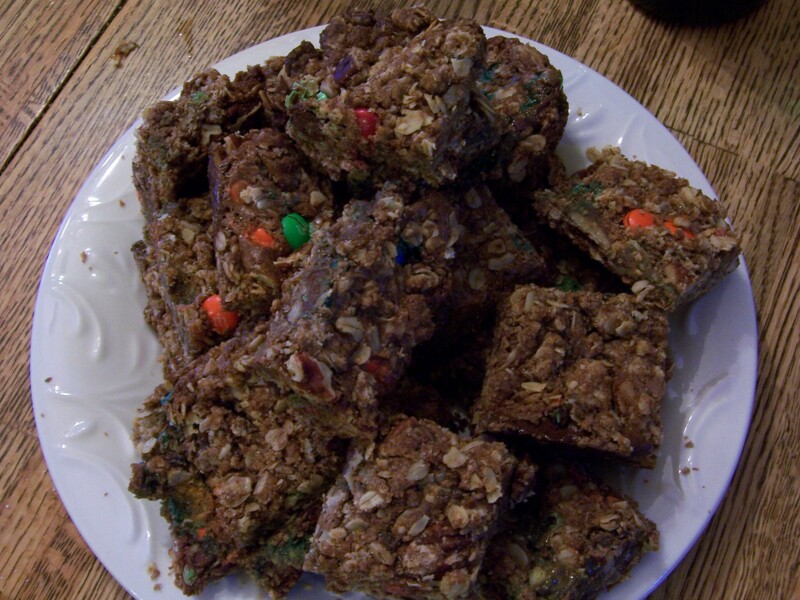 Mix together the oats, flour, nuts, brown sugar, baking soda, and melted butter. Reserve 1-1/2 cups of crumbs and press the remaining in a 13×9 greased pan. Bake 10 minutes in the preheated oven. While baking, make the filling. For the filling: using a large (4 cup) Pyrex bowl (or other microwavable container), melt the butter and ONE cup of the M&Ms in the microwave for about one minute. Stir and return to microwave for another 30sec-1 minute. Stir until the M&Ms are almost all melted … some coating will remain. Add the sweetened condensed milk and stir until completely blended. Pour over the baked layer — leaving about a half-inch all round the edges. Combine the remaining crumbs and half-cup of M&Ms in a bowl and then sprinkle on top of the filling, covering completely. Press the topping lightly into the filling. Bake about 20 minutes or until golden brown (be careful not to overcook!). Cool 30 minutes in the pan and then cut into bars and serve. WOW! Oh, my – I have no suggestions for a name for your jacket, but looking at the picture makes me want to snuggle up in it. It’s gorgeous! getting better all the time, but I have so many years to catch up on. The recipe…yum. Anything with sweetened condensed milk in it has to be good! Tracey … I’ve been knitting since I was about 8 … and since I’m turning 50 this year … yep, I’ve been knitting a LONG time! It is such a relaxing, cathartic activity for me … and recently I’ve been bringing my knitting with me everywhere which is very fun! The cookies are wonderful (had to have one after I posted the recipe) … and yes, anything with sweetened condensed milk is a good thing! Because I knit this jacket with a bulky wool (KP’s Cadena which is wool and alpaca) it is so soft and fluffy! With the cabling, it adds such nice insulation! I can’t wait till I’m done … altho, living in Virginia, I’ll need to put it away for the Fall! And yes, try the cookies … they are so good (I had to have one for “breakfast”after I posted this morning! 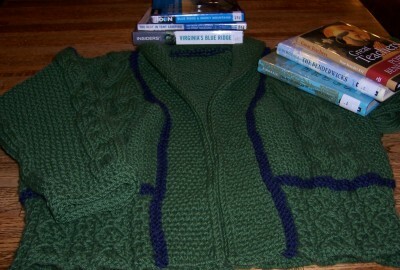 The sweater came out beautifully, it looks completed to me! Love the blue contrast color, it is perfect. Mary, that is the most gorgeous sweater I’ve seen in a long time! Wow. And so much fun and yumminess here today. Thank you for stopping by my blog today. Good luck in the giveaway! Beautiful new website! Those cookies look delicious! I’m awful with names so I’m afraid I can’t help you there … I really like the green with the navy, though. I like Entwined! Thanks for the suggestion … the fudge bars smell amazing and taste even better! Try ’em! Oh, I’ll have to check out the Rowan Kidsilk, it is beautiful! I thought the green by itself was just too heavy so the navy adds just a touch … I’m glad you like it, too!